In this section you will find information related to accommodations, hospitality and sales taxes collected in Beaufort County, Unincorporated Beaufort County, Bluffton and Hilton Head Island. 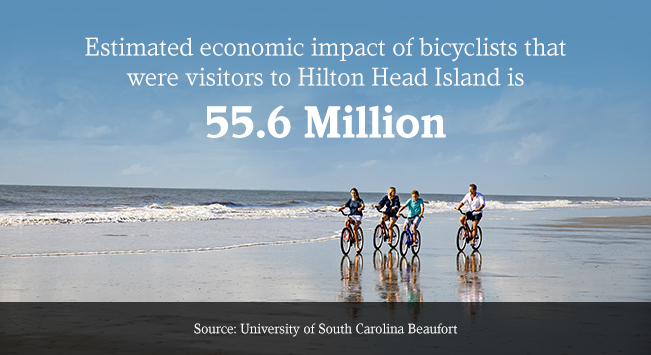 This section includes an economic impact analysis of Hilton Head Island Tourism in 2015 for Beaufort County, South Carolina. This report was released in April of 2016 by the South Carolina Department of Parks, Recreation and Tourism for the South Carolina Golf Course Owners Association. This section includes Visitor Surveys collected at the 2016 Hilton Head Island Boat Show. This section includes Visitor Surveys collected at the 2016 Hilton Head Island Wine and Food Festival. This section includes Visitor Surveys collected at the Hilton Head Island WingFest. This section contains Visitor Surveys collected at the 2016 Hilton Head Island Seafood Festival. This section includes the Hilton Head Island Destination Marketing Plan for FY 2016-2017. This section includes the Bluffton Destination Marketing Plan for FY 2016-2017. This section contains Visitor Surveys collected at the 2016 Hilton Head Island Snow Day. This section contains Visitor Surveys collected at the 2015 Hilton Head Island Oyster Festival. This section contains Visitor Surveys collected at the 2015 Hilton Head Island Motoring Festival and Concours d'Elegance. This section includes Visitor Surveys collected at the 2015 Burgers and Brew Festival. This section includes Visitor Surveys collected at the 2015 Bluffton Arts and Seafood Festival. This section includes Visitor Surveys collected at the 2015 Hilton Head Island Harbourfest. This section includes Visitor Surveys collected at the 2015 Hilton Head Island Wine and Food Festival. This section includes Visitor Surveys collected at the 2015 Hilton Head Island Seafood Festival. This section includes Visitor Surveys collected at the Hilton Head Island Wing Fest. This section includes the Bluffton Destination Marketing Plan for FY 2015-2016. This section includes the Hilton Head Island Destination Marketing Plan for FY 2015-2016. This report demonstrates the impact of SCPRT destination specific marketing programs on Hilton Head Island, Bluffton and the Lowcountry. Data points include tourism jobs and payroll, state and local visitor taxes, hotel revPAR, media impact, website users, media impact, private sector match, private sector product investment and business referrals. This section includes results of Visitor Surveys conducted during the 2014 Seafood Festival. This section includes results of Visitor Surveys conducted during the 2014 Wine and Food Festival. This section includes results of Visitor Surveys conducted during the 2014 WingFest. This section includes results of Visitor Surveys conducted during the 2013 Oyster Fest. This research study report was presented to the Hilton Head Island Marketing Council with a specific emphasis on visitors with a household income of 150,000 or higher. This summit was held at the Sea Pines Resort on May 6, 2014 to coincide with National Tourism Week. This section includes the Bluffton Marketing Plan for FY 2014-2015. This section includes the Hilton Head Island Destination Marketing Plan for FY 2014-2015. This section includes results of Visitor Surveys conducted during the 2014 Hilton Head Island Snow Day. This section pertains to results from the Visitor Profile Study with regards to the Canadian market. This section includes results of Visitor Surveys conducted during the 2013 Burgers and Brew Festival. The following information includes website performance for www.VisitBluffton.org as well as online search trends, visitation, origin Markets, online marketing performance campaigns and key metric trends. This report focuses on tennis research related to Hilton Head Island. The following information includes website performance for Online Search Trends, HiltonHeadIsland.org, Hilton Head Golf, VisitBluffton.org, and the Hilton Head Island Co-op. This section includes visitor survey results for the 2013 Historic Bluffton Arts and Seafood Festival. This section includes the destination marketing plan for Bluffton for FY 2013-2014. This section includes the Hilton Head Island Destination Marketing Plan for FY 2013-2014. This section includes information related to the number of visitors to Palmetto Bluff for calendar year 2012. This dashboard includes statistics related to website visitation for www.hiltonheadisland.org, lodging, group sales, and results for e-promotions and newsletters sent out year to date 2012. The Virtual Guest Book Visitor Survey research project began in February of 2012 and will continue until February 2013. The purpose of this survey research is to gain valuable data related to visitor expenditures, day visitor travel patterns, as well as visitor use of social media when planning a visit to the Bluffton/Hilton Head Island area. We have partnered with the University of South Carolina Beaufort Lowcountry and Resort Islands Tourism Institute to complete this research endeavor. Additionally, we have partnered with local businesses to facilitate the completion the survey by visitors to our area. This section includes the Hilton Head Island Marketing Plan for FY 2012-2013. This section includes the Bluffton Marketing Plan for FY 2012-2013. This powerpoint presentation was presented in May of 2012 to the Tourism Marketing Advisory Council. This powerpoint presentation was presented in May of 2012 to the Bluffton Marketing Council and the Bluffton Town Council. This section includes a presentation of the FY 2012-2013 Marketing Plan for Hilton Head Island given on May 22, 2012. This section includes a presentation of the FY 2012-2013 Marketing Plan for Bluffton given on May 23rd, 2012. This section includes a travel forecast presentation given by Young Strategies in May of 2012. This update was presented at the Bluffton Town Council meeting in March of 2013. This includes an update on the following: real estate sales, home construction statistics, future plans, employment and payroll statistics, preservation, conservation, tax revenue, charitable contributions, public events and number of visitors. This section includes a United States map that shows the attendance by state for the Arts Center of Coastal Carolina. This report was released in April of 2012 by the South Carolina Department of Parks, Recreation and Tourism for the South Carolina Golf Course Owners Association. This section includes lodging occupancy rates and will be updated on an ongoing basis. This section includes data related to the total number of golf rounds played at Lowcountry Golf Course Owners Association member facilities between January and November 2011. This section includes the visitation patterns over the last three fiscal years to the Coastal Discovery Museum at Honey Horn. Between the fiscal years of 2010 and 2011 there was an increase of 5,363 visitors. This section includes the visitation patterns over the last five fiscal years to the Pinckney Island National Wildlife Refuge. Between the fiscal years of 2010 and 2011 there was an increase of 59,224 visitors. This section includes the results of the Welcome Center Visitor Survey conducted between April 7th and August 7th, 2006. This section provides details related to the group leads generated in 2010 as well as the 2011 goals. This section includes Destination Marketing Plans for Hilton Head Island beginning in 2008 and concluding with the current year 2010-2011. A slight increase is detectable between December 2010 and the January 2011. Reasons for the increase in the United States Travel Price Index include the rising cost of motor and jet fuel prices, flight ticketing prices, and an escalation in lodging rates. This report includes a summary of a study conducted to analyze the economic impact as a result of the meetings industry. This information discusses the impact of gas prices on tourism for 2011 primarily shortened stays and less discretionary spending.